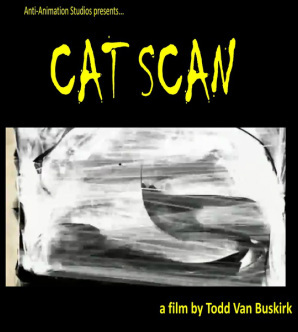 CAT SCAN - Todd Van Buskirk. Artist. A new anti-animation feature by director Todd Van Buskirk. A silent film. A study of a patient's body from the viewpoint of a Computed Tomography Scanner. As metal interferes with the workings of the CT scanner the patient will need to remove all jewelry and metal fastenings. In the majority of cases the patient will lie on his/her back, facing up. But sometimes it may be necessary to lie face-down or sideways. After the machine has taken one X-ray picture, the couch will move slightly, and then another picture is taken, etc. The patient needs to lie very still for best results. During the scan everybody except for the patient will leave the room. The radiographer will still be able to communicate with the patient, and vice-versa, through an intercom. If the patient is a child, a parent or adult might be allowed to stand or sit nearby - that person will have to wear a lead apron to prevent radiation exposure. A CT scanner emits a series of narrow beams through the human body as it moves through an arc, unlike an X-ray machine which sends just one radiation beam. The final picture is far more detailed than an X-ray one. Inside the CT scanner there is an X-ray detector which can see hundreds of different levels of density. It can see tissues inside a solid organ. This data is transmitted to a computer, which builds up a 3-D cross-sectional picture of the part of the body and displays it on the screen. Most places will provide the patient with a gown. He/she will need to undress, usually down to their underwear, and put the gown on. If the place does not provide a gown the patient should wear loose-fitting clothes. Any woman who suspects she may be pregnant should tell her doctor beforehand. Doctors may ask the patient to fast (eat nothing) and even refrain from consuming liquids for a specific period before the scan. The patient will be asked to lie down on a motorized examination table, which then goes into the giant doughnut-like machine. The couch with the patient goes into the doughnut hole.